Incorporation of Congregation Mickva Israel. One of the thirteen original states of the United States, situated on the Atlantic coast; settled by a chartered company of English colonists under James Oglethorpe in June, 1733. Its Jewish settlement dates almost from the foundation of the colony. The second vessel which reached the colony arrived in Savannah from England on July 11, 1733, and had among its passengers the following Jews: Dr. Samuel Nuñez Ribiero (also known as Dr. Nuñez) and Sipra Nuñez Ribiero, his mother; Moses Nuñez Ribiero, Daniel Nuñez Ribiero, Shem Noah; Isaac Nuñez Henriques, his wife and son; Raphael Bornal and wife; David de Olivera and wife; Jacob Lopez de Olivera, wife, and children; David, Isaac, and Leah de Olivera; Aaron Sepivea, Benjamin Gideon, Jacob Lopez de Crasto; David Lopez de Pas and wife; Vene Real (probably Villareal), Molena, David Moranda, Jacob Moranda; David Cohen del Monte and wife, together with their son Isaac Cohen, and daughters Abigail, Hannah, and Grace; Abraham Minis and wife, with their daughters Leah and Esther; Simeon Minis, Jacob Yowel, Benjamin Sheftall and wife; and Abraham de Lyon. These first settlers brought over with them a Sefer Torah with two cloaks, a circumcision-box, and an ark of the law. Prior to the settlement of Georgia commissions were issued (Sept. 21, 1732) to Anthony da Costa, Francis Salvador, and Alvaro Lopez Suaso of London, "to take subscriptions and collect money for the purposes of the charter." As early as January, 1733, and therefore before the actual settlement of Georgia, the trustees, having apparently learned that it was the intention of these gentlemen, who were among the most distinguished Jews of London, to settle some Jews in the colony, directed their secretary to wait upon Da Costa and his colleagues and require them to surrender their commissions. This action was repeated in 1733, the complaint being made that "certain Jews have been sent to Georgia contrary to the intentions of the trustees and which may be of ill consequence to the colony." Various other resolutions and correspondence upon this point appear in the minutes of the trustees, from which extracts are given by the Rev. GeorgeWhite in his "Historical Collections of Georgia" (New York, 1854). It has been assumed by Stephen ("History of Georgia"), by Charles C. Jones ("Publications Am. Jew. Hist. Soc." No. 1, pp. 5, 6), by Daly ("Settlement of the Jews in North America," p. 66), and by practically all writers on the history of Georgia, that the protests of the trustees related to this first settlement of Jews. Recently, however ("Publications Am. Jew. Hist. Soc." No. 10), Leon Hühner asserted that there were two sets of Jewish settlers who went to Georgia—Portuguese and German. The Portuguese were those whose names are given above, many of whom were refugees from the Inquisition and had independent means; while the Germans were dependent upon charity, and consisted of about twelve families sent over by a committee of the London congregation. The evidence for this statement is derived from the journal of the Rev. Mr. Bolzius, a Protestant clergyman who arrived in the colony in 1734 with a number of Protestant refugees from Salzburg. 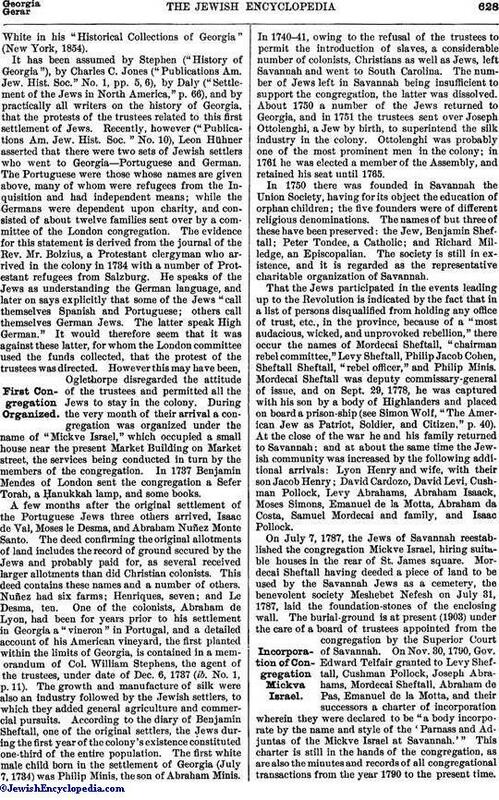 He speaks of the Jews as understanding the German language, and later on says explicitly that some of the Jews "call themselves Spanish and Portuguese; others call themselves German Jews. The latter speak High German." It would therefore seem that it was against these latter, for whom the London committee used the funds collected, that the protest of the trustees was directed. However this may have been, Oglethorpe disregarded the attitude of the trustees and permitted all the Jews to stay in the colony. During the very month of their arrival a congregation was organized under the name of "Mickve Israel," which occupied a small house near the present Market Building on Market street, the services being conducted in turn by the members of the congregation. In 1737 Benjamin Mendes of London sent the congregation a Sefer Torah, a Ḥanukkah lamp, and some books. A few months after the original settlement of the Portuguese Jews three others arrived, Isaac de Val, Moses le Desma, and Abraham Nu˜ez Monte Santo. The deed confirming the original allotments of land includes the record of ground secured by the Jews and probably paid for, as several received larger allotments than did Christian colonists. This deed contains these names and a number of others. Nu˜ez had six farms; Henriques, seven; and Le Desma, ten. One of the colonists, Abraham de Lyon, had been for years prior to his settlement in Georgia a "vineron" in Portugal, and a detailed account of his American vineyard, the first planted within the limits of Georgia, is contained in a memorandum of Col. William Stephens, the agent of the trustees, under date of Dec. 6, 1737 (ib. No. 1, p. 11). The growth and manufacture of silk were also an industry followed by the Jewish settlers, to which they added general agriculture and commercial pursuits. According to the diary of Benjamin Sheftall, one of the original settlers, the Jews during the first year of the colony's existence constituted one-third of the entire population. The first white male child born in the settlement of Georgia (July 7, 1734) was Philip Minis, the son of Abraham Minis. In 1740-41, owing to the refusal of the trustees to permit the introduction of slaves, a considerable number of colonists, Christians as well as Jews, left Savannah and went to South Carolina. The number of Jews left in Savannah being insufficient to support the congregation, the latter was dissolved. About 1750 a number of the Jews returned to Georgia, and in 1751 the trustees sent over Joseph Ottolenghi, a Jew by birth, to superintend the silk industry in the colony. Ottolenghi was probably one of the most prominent men in the colony; in 1761 he was elected a member of the Assembly, and retained his seat until 1765. In 1750 there was founded in Savannah the Union Society, having for its object the education of orphan children; the five founders were of different religious denominations. The names of but three of these have been preserved: the Jew, Benjamin Sheftall; Peter Tondee, a Catholic; and Richard Milledge, an Episcopalian. The society is still in existence, and it is regarded as the representative charitable organization of Savannah. That the Jews participated in the events leading up to the Revolution is indicated by the fact that in a list of persons disqualified from holding any office of trust, etc., in the province, because of a "most audacious, wicked, and unprovoked rebellion," there occur the names of Mordecai Sheftall, "chairman rebel committee," Levy Sheftall, Philip Jacob Cohen, Sheftall Sheftall, "rebel officer," and Philip Minis. Mordecai Sheftall was deputy commissary-general of issue, and on Sept. 29, 1778, he was captured with his son by a body of Highlanders and placed on board a prison-ship (see Simon Wolf, "The American Jew as Patriot, Soldier, and Citizen," p. 40). 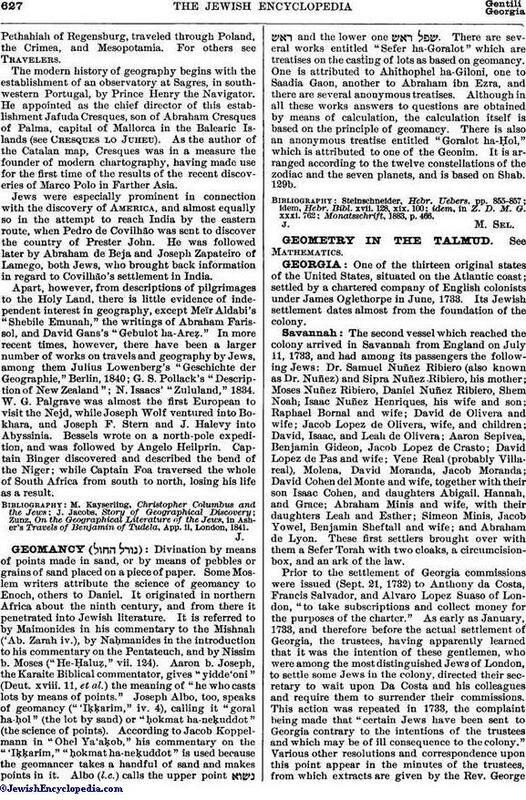 At the close of the war he and his family returned to Savannah; and at about the same time the Jewish community was increased by the following additional arrivals: Lyon Henry and wife, with their son Jacob Henry; David Cardozo, David Levi, Cushman Pollock, Levy Abrahams, Abraham Isaack, Moses Simons, Emanuel do la Motta, Abraham da Costa, Samuel Mordecai and family, and Isaac Pollock. On July 7, 1787, the Jews of Savannah reestablished the congregation Mickve Israel, hiring suitable houses in the rear of St. James square. Mordecai Sheftall having deeded a piece of land to be used by the Savannah Jews as a cemetery, the benevolent society Meshebet Nefesh on July 31, 1787, laid the foundation-stones of the enclosing wall. The burial-ground is at present (1903) under the care of a board of trustees appointed from the congregation by the Superior Court of Savannah. On Nov. 30, 1790, Gov. Edward Telfair granted to Levy Sheftall, Cushman Pollock, Joseph Abrahams, Mordecai Sheftall, Abraham de Pas, Emanuel de la Motta, and their successors a charter of incorporation wherein they were declared to be "a body incorporate by the name and style of the 'Parnass and Adjuntas of the Mickve Israel at Savannah.'" This charter is still in the hands of the congregation, as are also the minutes and records of all congregational transactions from the year 1790 to the present time.Under date of May 6, 1789, Levy Sheftall, in behalf of the Hebrew congregation of Savannah, presented an address to General Washington on the occasion of his election to the presidency, to which Washington made a gracious reply (see "Publications Am. Jew. Hist. Soc." No. 3, pp. 88, 89). From 1797 until 1820 there was quite an exodus from Savannah. In the last-mentioned year, however, the Jewish community began to increase. A building committee for the erection of a synagogue was appointed; and the city of Savannah granted to the congregation a plot of ground situated at the corner of Liberty and Whitaker streets. On July 21, 1820, the new building was consecrated by the honorary ḥazzan, Dr. Jacob de la Motta, who delivered an address. This address was published, and it is one of the earliest prints bearing upon the history of the Jews of America: a copy of it is preserved in the Leeser Library, Philadelphia. Copies were sent by De la Motta to Thomas Jefferson and James Madison, from both of whom sympathetic replies were received. On Dec. 4, 1829, the synagogue was destroyed by fire, but the scrolls of the Law and the Ark were saved uninjured. In 1838 the erection of a brick structure upon the old site was commenced, and it was consecrated Feb. 24, 1841, by Isaac Leeser. 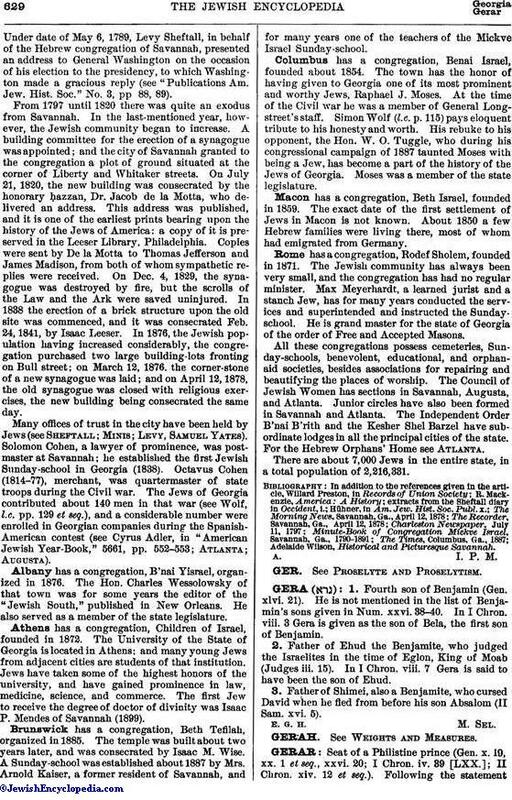 In 1876, the Jewish population having increased considerably, the congregation purchased two large building-lots fronting on Bull street; on March 12, 1876, the corner-stone of a new synagogue was laid; and on April 12, 1878, the old synagogue was closed with religious exercises, the new building being consecrated the same day. Many offices of trust in the city have been held by Jews (see Sheftall; Minis; Levy, Samuel Yates). Solomon Cohen, a lawyer of prominence, was postmaster at Savannah; he established the first Jewish Sunday-school in Georgia (1838). Octavus Cohen (1814-77), merchant, was quartermaster of state troops during the Civil war. The Jews of Georgia contributed about 140 men in that war (see Wolf, l.c. pp. 129 et seq. ), and a considerable number were enrolled in Georgian companies during the Spanish-American contest (see Cyrus Adler, in "American Jewish Year-Book," 5661, pp. 552-553; Atlanta; Augusta). Albany has a congregation, B'nai Yisrael, organized in 1876. The Hon. Charles Wessolowsky of that town was for some years the editor of the "Jewish South," published in New Orleans. He also served as a member of the state legislature. Athens has a congregation, Children of Israel, founded in 1872. The University of the State of Georgia is located in Athens; and many young Jews from adjacent cities are students of that institution. Jews have taken some of the highest honors of the university, and have gained prominence in law, medicine, science, and commerce. The first Jew to receive the degree of doctor of divinity was Isaac P. Mendes of Savannah (1899). Brunswick has a congregation, Beth Tefilah, organized in 1885. The temple was built about two years later, and was consecrated by Isaac M. Wise. A Sunday-school was established about 1887 by Mrs. Arnold Kaiser, a former resident of Savannah, and for many years one of the teachers of the Mickve Israel Sunday-school. Columbus has a congregation, Benai Israel, founded about 1854. The town has the honor of having given to Georgia one of its most prominent and worthy Jews, Raphael J. Moses. At the time of the Civil war he was a member of General Longstreet's staff. Simon Wolf (l.c. p. 115) pays eloquent tribute to his honesty and worth. His rebuke to his opponent, the Hon. W. O. Tuggle, who during his congressional campaign of 1887 taunted Moses with being a Jew, has become a part of the history of the Jews of Georgia. Moses was a member of the state legislature. Macon has a congregation, Beth Israel, founded in 1859. The exact date of the first settlement of Jews in Macon is not known. About 1850 a few Hebrew families were living there, most of whom had emigrated from Germany. Rome has a congregation, Rodef Sholem, founded in 1871. The Jewish community has always been very small, and the congregation has had no regular minister. Max Meyerhardt, a learned jurist and a stanch Jew, has for many years conducted the services and superintended and instructed the Sunday-school. He is grand master for the state of Georgia of the order of Free and Accepted Masons. All these congregations possess cemeteries, Sunday-schools, benevolent, educational, and orphanaid societies, besides associations for repairing and beautifying the places of worship. The Council of Jewish Women has sections in Savannah, Augusta, and Atlanta. Junior circles have also been formed in Savannah and Atlanta. The Independent Order B'nai B'rith and the Kesher Shel Barzel have subordinate lodges in all the principal cities of the state. For the Hebrew Orphans' Home see Atlanta. There are about 7,000 Jews in the entire state, in a total population of 2,216,331. Adelaide Wilson, Historical and Picturesque Savannah.